New game project. Finded kind a easy gameengine for Delphi and C++ - Omega SDK. It also have Linux port so tried to learn it by making simple game with easy collsion detection and gameplay. 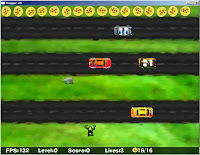 Frogame is classic Frogger style game. You just need to collect 16 pizzas in each levels avoiding cars and dangerous objects. Tried to add joypad support,but buttons didnt worked correctly.